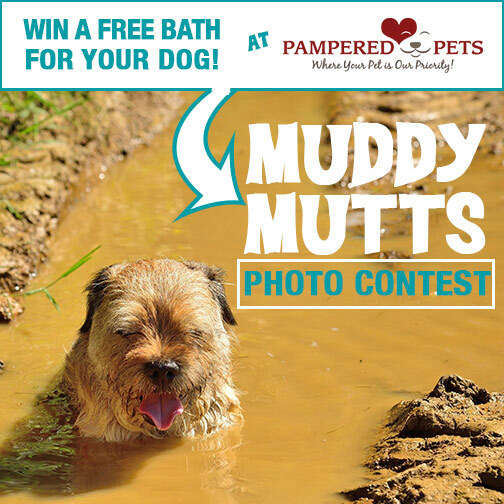 Send us a picture of your muddiest mutt, dirtiest dog or or just plain stinkiest pooch for a chance to win a free bath and nail trim at Pampered Pets! You share a a photo with us of your muddy mutt and we’ll upload it to our Muddy Mutts Photo Contest Facebook album for voting. The photo with the most “likes” as of Friday, October 30th at 5PM EST will win a free bath and nail trim in our salon. Email your entries today to [email protected] with your name and the name of your dog and “vote” online! The sooner you enter the more time you will have to collect votes! All entries will be posted on the Pampered Pets’ Facebook page inside the Muddy Mutts Photo Contest Album within a day of being received. The photo with the most “likes” as of October 30th at 5PM EST will win a free bath and nail trim for their dog. Only “likes” made on the photo within the Pampered Pets Muddy Mutts Album will counted in the contest. Pampered Pets takes no responsibility for technical issues that may arise during this contest. In the event of a tie, a committee of three Pampered Pets team members will decided between the two entries. By emailing your photo to [email protected], you agree to allow Pampered Pets to post your image on social media, in the Pampered Pets lobby and/or on the Pampered Pets website.